Texas Homeowners Association Law is an essential guidebook on all Texas and Federal laws governing the administration and operation of Texas Homeowners Associations and is the only comprehensive legal reference manual that is written specifically for directors, officers and homeowners in Texas Homeowners Associations. Revised and updated, the Third Edition of Texas Homeowners Association Law incorporates all of the pertinent new laws enacted through the 2015 Texas legislative session and includes more than twenty-five sample forms for use by Texas Homeowners Associations and homeowners. In addition, with more than 2,500 annotations and citations to Texas and Federal statutes and appellate court decisions, as well as a table of authorities and subject index to assist readers in quickly identifying applicable topics by key words or subject matter, Texas Homeowners Association Law is also an indispensable tool for property managers, realtors, and attorneys who work with association-governed communities in Texas. 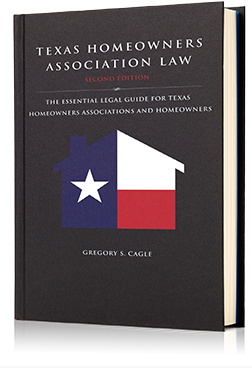 The third edition of Texas Homeowners Association Law is now available for purchase. Use the promo code “THIRDEDITION25” to get 25% off the cover price. The first and only legal compliance software for Texas HOAs. TEXAS HOA MANAGER is a legal compliance software solution developed specifically for Texas Homeowners Associations that provides step-by-step instructions for performing all day-to-day management operations in compliance with Texas law, access to interactive forms that conform to Texas law (and that are updated as laws change), access to an online version of the Texas Homeowners Association Law book, and much, much more. For more information you can watch the video below or go to www.TexasHOAManager.com.